What Happens When You Use an Extension Cord with a Dishwasher? When your dishwasher isn’t located near a power outlet, the answer may seem to lie in the use an extension cord — because, let’s face it, that may seem easier than rearranging your kitchen and moving your dishwasher. So what happens when you use an extension cord with a dishwasher? We’ve got some shocking pictures to answer this question. 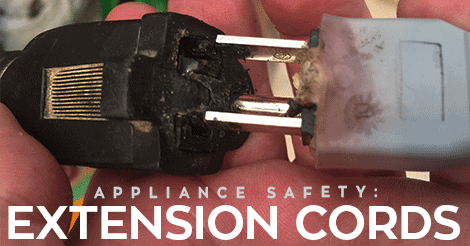 Extension cords are built for a temporary electrical connection and not to be used in permanent installations. Dishwashers use a lot of power, especially during the heating cycle. We recommend to never use an extension cord to connect your dishwasher to an electrical outlet. Yes, using an extension cord will work, but it’s extremely dangerous. 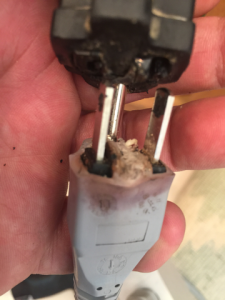 Your power cord will eventually overheat, causing your cord and anything surrounding the cord to melt. This can lead to potential fire risks, costing your family money and risking their safety. 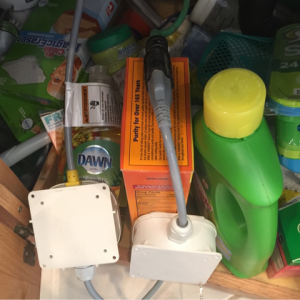 So what do you do if an extension cord is your only solution to powering your dishwasher? We suggest these dishwasher power cords, which are made specifically to withstand the power of a dishwasher. Don’t see your dishwasher’s brand here? There are a lot more to choose from on Amazon. If you have any questions or concerns about dishwasher safety, feel free to contact Tiger Mechanical.